1) Jews are more loyal to Israel than to [this country/the countries they live in]. 2) Jews have too much power in the business world. 3) Jews have too much power in international financial markets. 4) Jews don’t care about what happens to anyone but their own kind. 5) Jews have too much control over global affairs. 6) People hate Jews because of the way Jews behave. 7) Jews think they are better than other people. 8) Jews have too much control over the United States government. 9) Jews have too much control over the global media. 10) Jews still talk too much about what happened to them in the Holocaust. 11) Jews are responsible for most of the world’s wars. I am surprised that the number is not closer to 7 billion. Jews are only 2-3% of the USA population, and much less than 1% of the world population. It is an obvious fact that they have much more power and control than that. It is also obvious that Jews talk about the Holocaust much more than is interesting to non-Jews. The Tiger mom and her Jewish husband wrote a whole book on how Jews think they are better than other people. Someone might say that Hitler hated Jews because of the way Jews behave, and that makes Hitlet anti-Semitic, but it does not make someone anti-Semitic for holding that opinion about Hitler. Jews do commonly have strong loyalties to Israel. Don Sterling bragged to Anderson Cooper about how Jews take care of their own kind. I don't know how Jews could be responsible for most of the world’s wars. I didn't know that was a stereotypes. Most of the world's wars have not involved Jews, as far as I know. I once posted Ten Jewish stereotypes, but this list is weird. Only the Jews go around doing phony name-calling surveys like this. 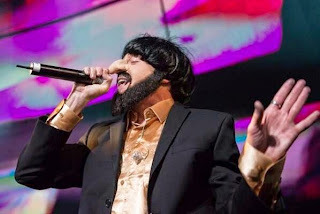 Update: ADL weighs in on the supposedly anti-semitic costume of a pro-LGBTQIA rapper. Obviously more hate speech. What's the point of your posting ? Are you just saying that you think that the entire world population should be anti Semitic ? According to the ADL definition, yes, the whole world should be anti-semitic. And yes, the ADL propaganda is hate speech. OH VEY! GOOD GOYIM! Never criticize your Zionist overlords! Remember, according to our Talmud, you non-jews exist simply to serve us Jews. If it's not Gays, it's Blacks, or Jews. This isn't a blog about the family court system. Anyone ever notice how George has complained about everyone in the court system, but only blames Gays and Jews for his predicament ? I don't follow. What makes this a phony name calling survey ? Why is it phony, and where's the name calling in it ? The NY Mag story shows some problems with the survey. These statements do not really identify anti-semitism. It confuses Jews with Semites, for one thing. There may be a billion people with some antagonism towards Jews, but this survey does not tell us much. Ok, so what's a flawed survey about anti-semitism doing in your blog about family courts ? You're right, it is somewhat off-topic. I only posted it because it related to a couple of other postings, and to accusations of anti-semitism. Given that your blog has been compared to Mein Kampf, by commenters, you have to wonder what the real topic of the blog is.